Do you enjoy making punch art? I love playing around with punched pieces and seeing what new combinations I can create. I always feel like I got more than what I paid for when I can make my punches do more than the obvious. 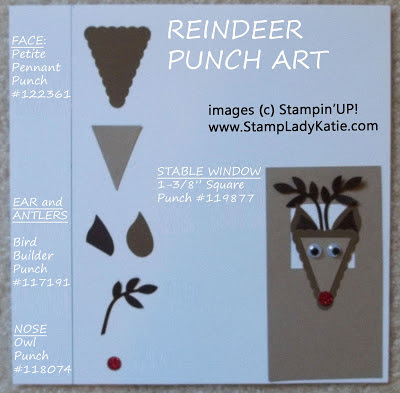 This Punch Art Reindeer is made from 4 different punches: the Pennant Punch, the Bird Builder Punch, a small circle punch and a square punch. Although, the square punch is just to make the stable window and you could cut that with the blade on your paper trimmer. Do you own these punches? If you DO already own these punches then its pretty easy for you to figure out how to make him. If you DON'T own the punches then this photo recipe card will help you see how he's made. And don't you just love the self-stick googlie eyes. I could have done the eyes with punches too but I just love using the little wiggly eyes. There are a few other differences between the card above and the set of instructions. (2) The Face: card I used DSP (Designer paper) and on the instruction sheet I used plain paper. The DSP might be a little much? What do you think? (3) The Ears: on the card I used just 1 color but on the instruction sheet I used 2 colors. I think I like the 2 colors better. 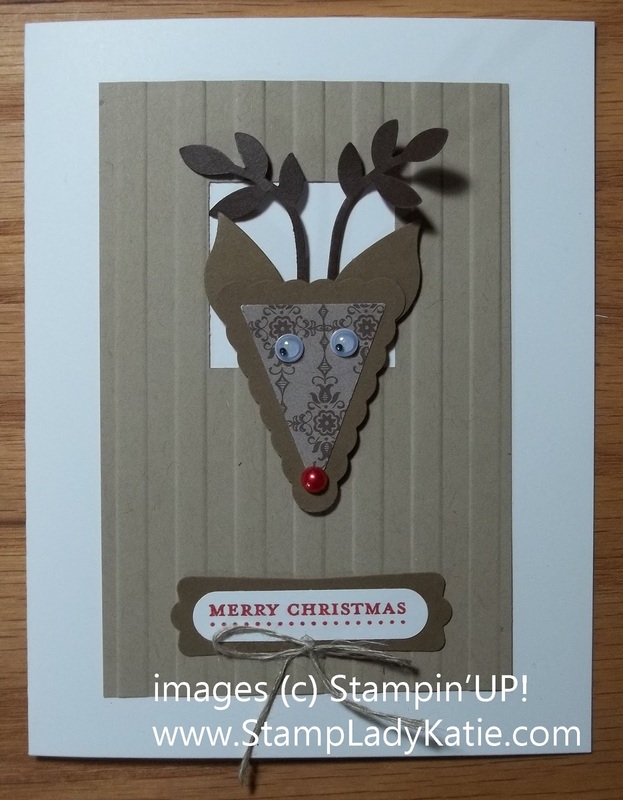 Here is another punch art reindeer - this one is used as a bag topper for some candy treats. Did you find this interesting and useful? Share this information with others. Tell all your crafty friends about this website. ONLY 2 DAYS LEFT TO GET YOUR FREE INK PADS! And during December all orders earn DOUBLE POINTS!